I can’t wait to share this chicken fillets recipe with all my readers because the taste of them is very unique and sensational. My lovely daughter asked me to cook this dish for her repeatedly. I got thumbs up at the first time of serving this dish on our dining table. Both tomato ketchup and Dijon mustard are very popular in cooking. But blending these two sauces together will make a big difference in taste that you’ve ever imagined before. As for mustard, I love Dijon mustard very much as it’s not too hot but with a very special flavor. 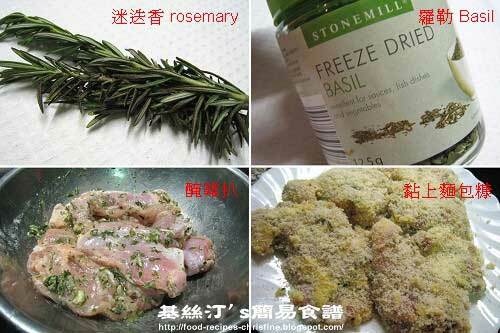 In addition, the rosemary and basil are very good “friends” in boosting up the flavor of chicken. It’s so yummy that I couldn’t wait until the dish is completely prepared. I ate one small piece of chicken fillet at the minute I finished cooking. Shhhh….. Mix all marinade ingredients to a thick paste. Rinse and wipe dry chicken fillets, trim them if needed. Mix well with the marinade paste for 15 minutes. 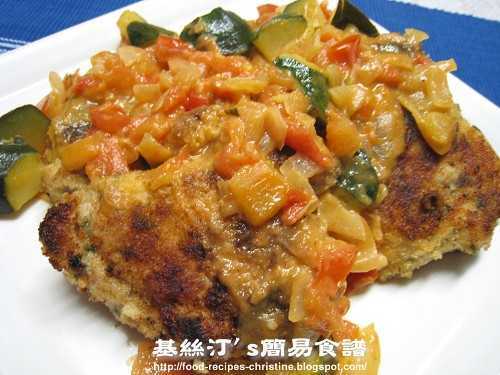 Coat the chicken fillets with whisked egg, then bread crumbs. Carefully set them on a plate and put in the fridge to chill for 15 minutes. Heat up a non-stick pan on medium heat, add 2 tablespoons of butter. Fry chicken fillets on both sides till lightly brown. Lower the heat to fry chicken until done. Use a skewer or a chopstick to test the chicken. If clear liquid runs out, the chicken is cooked through. Dish up. Add more butter on pan, sauté onion on medium heat. Add zucchini, sprinkle with salt to taste, sauté until soft. Add tomato with 2 tablespoons of sugar, stir well. Pour in seasoning and cook a little while until sauce thickens. Pour sauce over fried chicken fillets. Done. When frying chicken thigh fillets, beware of the heat. Don’t use too high, they would be burnt otherwise. Before pouring the sauce over the chicken, you can adjust the sauce to your own taste. Add more sugar if it’s too sour.